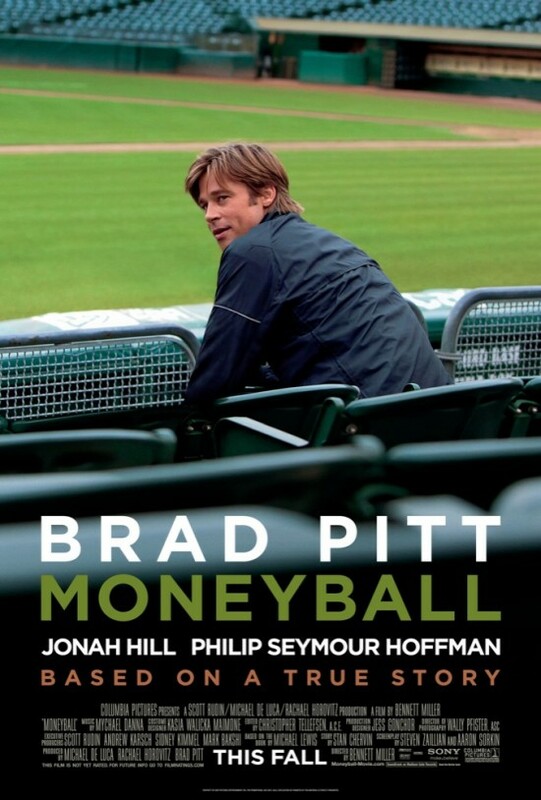 Moneyball is based on the (supposedly great) book by Michael Lewis (who also wrote The Blind Side), and tells the story of Billy Beane (Brad Pitt), a once-promising baseball player who in 2001 was general manager of the Oakland A’s and still felt like he had something to prove. Oakland, you see, is not one of the rich teams like the Yankees or Red Sox, and doesn’t have the deep pockets those teams do to “buy” good players. So attracting big names is always a challenge. Young upstart Peter Brand (Jonah Hill) turns Beane on to the then-radical approach of Bill James, which focuses more on stats like on-base percentage than home runs, and costs a lot less to execute. So Beane adjusts his (and the team’s) priorities, shunning the name-brand players and instead seeking the undervalued, overlooked ones. 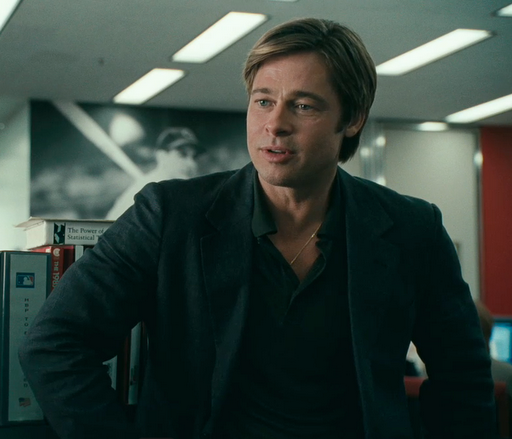 If you’re not a baseball fan, you may enjoy Moneyball. But it sure does help if you have a love of the game and appreciate the “inside” talk and statistical minutiae that forms the basis of much of the dialogue. Of course, when you have a guy like Pitt delivering that dialogue, the film gets infinitely easier to watch. That’s because as Beane, Pitt gives one of the most deceptively good performances of the year. It’s so good that it looks like he’s not even acting — just coasting on his charm. And Pitt sure does make it look easy. (Then again, when you’re speaking dialogue that was written by both Steven Zaillian and Aaron Sorkin, that has to raise your game.) More so than in many of his other performances, Pitt has the same All-American aura that Robert Redford once had. Watch for Moneyball and The Natural to be shown as a double feature soon. Pitt and Hill have a nice chemistry together as they bounce (and explain) concepts, ideas, and mathematical formulas off each other. It’s great banter in the trademark Sorkin style. You may not follow all the details, but it sure is fun to listen to — and it’s often very funny, too. Director Bennett Miller (Capote) knows better than to interfere with stylish camerawork and other filmmaking tricks, so he pretty much gets out of the way, letting the screenplay and the actors do all the work. The result is an inside-baseball story with grit and class, one that shows the best teams aren’t always the ones with all the money. 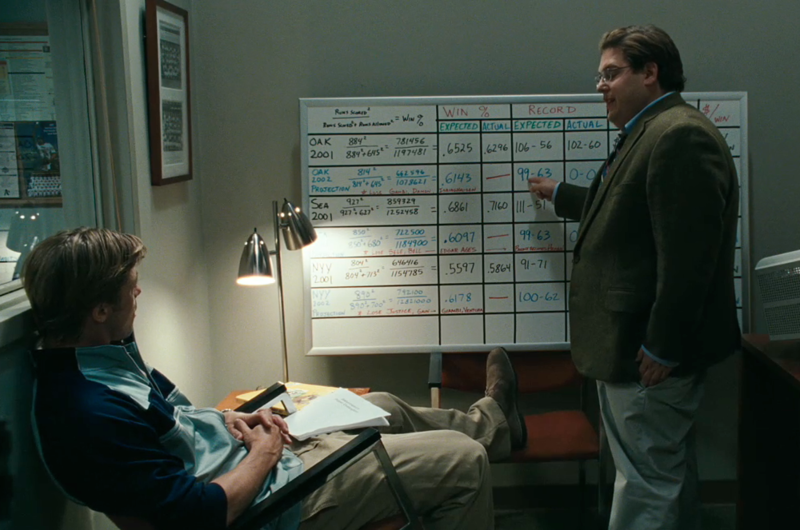 Moneyball is a tale of underdogs for the dirt dog in all of us. If you can’t root for your own hometown team (or even if you can), you’ll surely root for Moneyball. I’m giving it an A–.